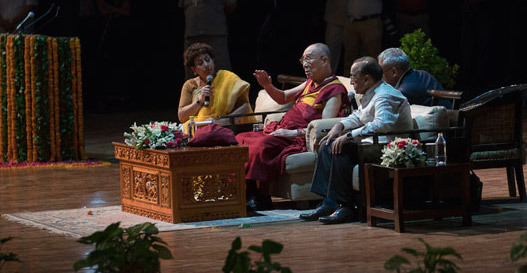 New Delhi, India – His Holiness the Dalai Lama was received by the welcoming committee of the Association of British Scholars (ABS), as he arrived at the Siri Fort Auditorium this morning and escorted to the stage. The ABS is a national forum to facilitate the networking of Indians who have studied or trained in the UK. It aims to strengthen Indo-UK relations by sharing information and hosting social, cultural and intellectual activities. The event was introduced with authority and aplomb by Rini Khanna, a well-known news anchor, whose voice also provides reassurance to travellers on the Delhi Metro. She described several aspects of His Holiness’s life, stating that a spirit of kindness and compassion emanates from him, although he persists in describing himself as a simple Buddhist monk. The welcoming committee offered an outsize garland of flowers that encircled all of them and His Holiness. Quoting His Holiness as asserting that achieving happiness is the purpose of life, ABS President Vipin Chopra formally introduced him to the capacity audience of 2000 and invited him to address them. His Holiness began by explaining that while he generally prefers to stand when speaking to a crowd, he is beginning to acknowledge that at the age of 82 he finds it increasingly tiring. Consequently, he sought permission to speak sitting down. “Brothers and sisters—this is how I always like to begin—I’d like to thank you for giving me this opportunity to talk to you. As human beings all 7 billion of us are born the same way and die the same way. Physically, mentally and emotionally we are the same. We all want to live a happy life and wish to avoid problems. We grow up in the shelter of our mother’s love and affection. Some scientists even say that at a certain stage a mother’s physical touch is crucial for the proper formation of the brain. “On the one hand, scientists have concluded that basic human nature is compassionate—which I regard as a sign of hope. On the other, they point out that constant fear, anger and stress undermine our immune system. The reality is we are social animals for whom love and affection are key factors contributing to our happiness. We need to remember this because we live in a materialistic culture that doesn’t pay much attention to inner values. “A lot of problems we face, from violence to the gap between rich and poor and routine bullying and exploitation, are of our own making. They arise due to a lack of real concern for others and a lack of respect for their rights. Self-centredness, which is the basis for competitiveness and jealousy, provokes fear, irritation and anger, which in turn can give rise to violence. If we carry on the way we’re going, there’s a risk that the 21st century will end up like the 20th century before it—an era of violence and bloodshed. During that time, historians estimate, 200 million died violently. So what can we do? Say more prayers and perform more rituals? We Tibetans did that from the early ‘50s onwards to little effect. We need to take action on the basis of vision and sincere motivation. “Our existing education system, oriented towards material goals with little time for inner values, is inadequate when it comes to bringing about a happier more peaceful world. We used to rely on religion for inner values, but today 1 billion people show no interest in religion anymore and even among the remaining 6 billion the faith of many is shallow. “Having examined what actually destroys our peace of mind, we need a new approach to education, from kindergarten right through to university, which can guide us in tackling our disturbing emotions. Just as we protect our health by observing physical hygiene, we must take steps to adopt emotional hygiene. By employing our intelligence and common sense, we can tackle our destructive emotions. It’s not difficult to see how irritation leads to anger. Common sense also tells us that anger is bad for our health. His Holiness explained how the 8th century Tibetan Emperor Trisong Detsen invited the preeminent Nalanda master Shantarakshita to Tibet. He established the Nalanda Tradition of Buddhism which involved philosophy, psychology and logic rather than prayers and rituals. This tradition has been preserved for more than a thousand years as succeeding generations have engaged in rigorous study. His Holiness made clear that ancient Indian knowledge of the workings of the mind and emotions, assessment of reality and use of logic are of utmost relevance today. He stressed his view that India is the one country with the potential to pursue modern education and economic development, while combining it with knowledge from ancient India. Answering questions from the audience His Holiness clarified that far-sightedness and warm-heartedness are crucial to being able to forgive. He recommended that when it comes to raising children, parents should not stint on the love and affection they show their offspring, or on the time they spend with them. Asked how to acquire wisdom he replied, “Study.” He agreed with a suggestion that some people regard compassion and kindness as signs of weakness. He suggested that people who think like that also think you only have to be tough to make money. They also tend to think that anger brings energy to whatever it is they are trying to do without realising that the energy is blind. He spoke about becoming a refugee and the freedom it brought. In particular, he was freed of the hypocritical pretence he had had to maintain when dealing with Chinese officials in Tibet over several years. Before the event was concluded with a vote of thanks, His Holiness announced that he would like to speak to the many Tibetans in the hall, mostly young students, in their own language. He told them that Tibet’s is an ancient civilization. He encouraged them to keep up their study of Tibetan, the language of the Kangyur and Tengyur, the literature of the Nalanda Tradition and the language that binds Tibetans together. 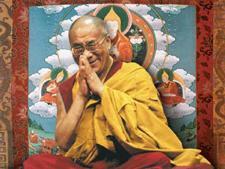 He urged them to be proud of being Tibetan, and proud of their language and culture. They responded with warm and enthusiastic applause. Anjali Kwatra formally thanked His Holiness for accepting the invitation and for being an example of peace and compassion for the world. She also expressed gratitude and appreciation to everyone who had contributed to the success of the event. Tibetans respectfully lined the road as His Holiness left for his hotel. Tomorrow, he will travel to Mumbai.